Get Busy Living: Thankful for God's Sense of Humor! Oh boy do I have no doubt that our God is a God with a sense of humor! I couldn't remember what this week's challenge was for my challenge, but when I looked it up I laughed out loud. Make your glass half full! No complaining about being single, criticizing yourself, rolling your eyes, or hosting any pity parties this week. Focus on the joy God is bringing into your life! Share it with us: What awesome, joy bringing things is God doing in your life RIGHT NOW? What can you be thankful for? The reason I laughed is because last week I was totally throwing myself a pity party. I was being sad and mopey. So, God's timing on this week's challenge is just an example of His sovereignty! Love it! God is definitely bringing me joy! He has brought me a closer and stronger relationship with Him. For the first time ever, I actually have been consistent in my quiet time. Not because I feel like it is an obligation, but because God has been showing so much to me of His character and faithfulness every time I spend time in His Word! 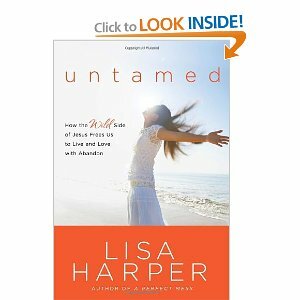 For yet another example of His "irony", check out the cover of the new book I am working through in my quiet time: Lisa Harper's "Untamed". Look familiar? Will you join me this week in being thankful? In making your glass half full? In finding JOY in each day? Hello! I'm participating in the Completing Him Challenge, too! May God Bless Your Marriage as you seek to respect your husband today! I also just love how God gives us exactly what we need, even if we don't know what it is! Joining you this week to Choose Joy! Thanks for sharing and being a blessing. Beautiful post! I am so thankful for God's patience with me. His Love brings me the joy I need to break free. I was sitting in a half-empty glass when I woke this morning. It was my own tightly confining pity puddle in a foggy glass. And then I found His encouragement and so many great people to share it with. I am grateful for bloggers, like you, who share their faith and hope. Understand that it is a gift to be single. Yes, I am married and have children, and that is a rich blessing indeed, for me. *smile* Your blessings are different from mine if you are not married with children though. It's not that your are cursed because you are single. Please don't think it a bad thing, the Lord calls it a gift, though I appologize for not having chapter and verse. There are things a single lady can do that married ladies are not "free" to do. Remember married or single we are first Christ's children and so must behaive as such. Focus on Him in all things and you will grow. Sincerely, Mommy of two little blessings & so much more!